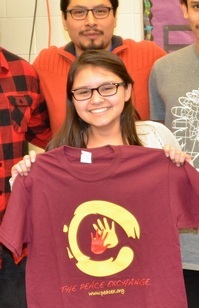 Peace Builder Ashley Carreon was sponsored by The Resurrection Project. From Little Village, Ashley is a student at the University of Illinois, Champaign. 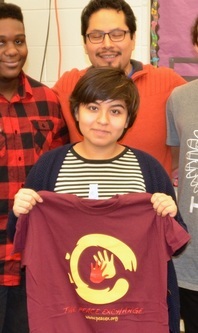 Peace Builder Jocelyn Duran was sponsored by Josephinum Academy. Jocelyn is a student at Pomona College. Jocelyn is from Little Village. 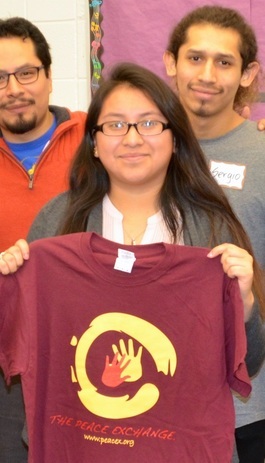 Peace Builder Mariah De La Fuente was sponsored by Josephinum Academy. Mariah is a student at DePauw University. Mariah is from Avondale. 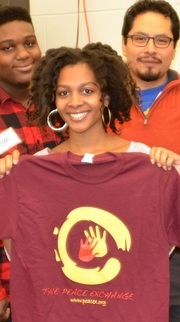 Peace Builder Shaina Jones was sponsored by Donda's House. Shaina is a student at the Berklee College of Music. Shaina also serves as the Peace Exchange's Program Assistant. Shaina lives in South Deering. 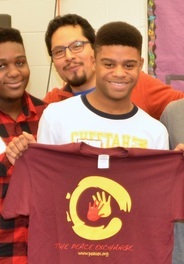 Peace Builder Tyler Matthews was sponsored by DRW College Prep. Tyler attends National Louis University. Tyler lives in East Garfield Park. Peace Builder Andrew Moore was sponsored by Holy Family School. Andrew attends Valparaiso University. Andrew is from North Lawndale.